MiniUPnP is commonly used to allow two devices which are behind NAT firewalls to communicate with each other by opening connections in each of the firewalls, commonly known as “hole punching”. Various software implementations of this technique enable various peer-to-peer software applications, such as Tor and cryptocurrency miners and wallets, to operate on the network. In 2015 Talos identified and reported a buffer overflow vulnerability in client side code of the popular MiniUPnP library. The vulnerability was promptly fixed by the vendor and was assigned TALOS-CAN-0035 as well as CVE 2015-6031. Martin Zeiser and Aleksandar Nikolic subsequently gave a talk at PacSec 2015 ("Universal Pwn n Play") about the client side attack surface of UPnP and this vulnerability was part of it. Talos has developed a working exploit against Bitcoin-qt wallet which utilizes this library. The exploit developed by Talos includes a Stack Smashing Protection (SSP) bypass, the details of which we will discuss here. The buffer overflow is triggered by a call to memcpy function with an unchecked length parameter “l”. Since datas->cureltname is a fixed size buffer inside the IGDdatas structure, supplying a large length will result in a buffer overflow on the stack. In the above code the specified length is the actual length of the name string which comes straight from the XML element being parsed. A potential attacker has full control over the length and contents of the memcpy source argument that is being copied into a destination buffer of size MINIUPNPC_URL_MAXSIZE. After fetching the rootDesc.xml file, the MiniUPnP library starts parsing it and this is when the vulnerability can be exploited. Bitcoin-qt is the default bitcoin client and a reference implementation and was chosen as an interesting target to demonstrate the exploitability of this vulnerability. It too, being a peer to peer application, uses the same UPnP mechanism as described above. The vulnerability can be triggered by setting up a fake UPnP server on the victims LAN that would serve an XML description file (rootDesc.xml) with overly long element names. This mitigation presents an obstacle for successful exploitation of this vulnerability. Having exploited the vulnerability within the MiniUPnP library but being blocked by SSP within Bitcoin-qt, we decided to look at how we can actively exploit this to achieve an SSP bypass. SSP is a compile time exploitation mitigation that can be enabled on modern compilers. Among other things, it makes sure that potentially vulnerable stack buffers are guarded by a random stack canary. Traditional stack buffer overflow exploitation requires a return address overwrite to achieve arbitrary code execution. 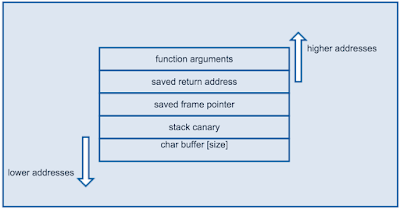 In overwriting the return address, the stack canary will be overwritten too, which can be detected when the function returns, at which point the stack smashing protection kicks in and terminates the process. Details of SSP implementation are out of scope if this article. Readers can refer to a write up by Adam Zabrocki for additional details on this subject. 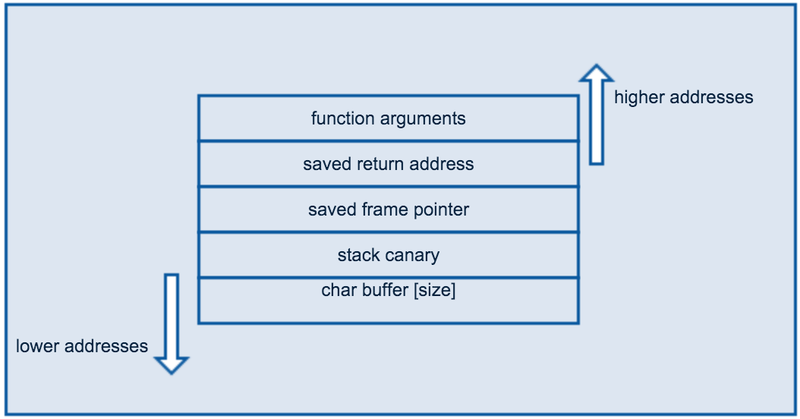 In overwriting the return address, the stack canary will be overwritten too, which can be detected when the function returns, at which point the stack smashing protection kicks in and terminates the process. 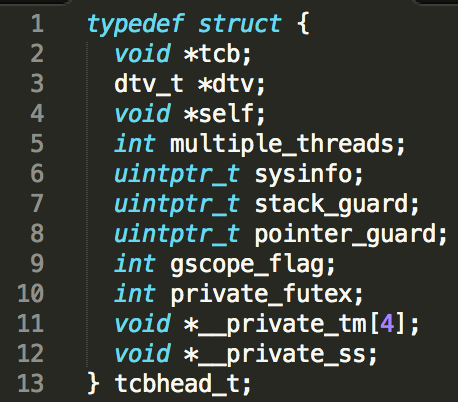 In the above assembly listing it can be observed that if the stack cookie check fails, function __stack_chk_fail is called. What’s interesting is that, when the stack smashing is detected, the process isn’t terminated right away. A fair bit of code is executed first to notify the user and log the crash. This fact has been abused and exploited before to get information leaks and code execution. Notably, a post by Dan Rosenberg shows how this messaging along with overwriting process arguments array can be used for info leaks. Joshua Drake also wrote about an example of abusing an unlimited overflow to overwrite heap metadata thereby bypassing SSP to achieve code execution. To exploit this MiniUPnP vulnerability in Bitcoin-qt we take a similar approach of abusing SSP’s post detection behavior. At offset 0x10, there is a sysinfo pointer. During process runtime it points to the location of the __kernel_vsyscall function which in turn invokes the syscall via sysenter mechanism. The sysinfo pointer in the TCB gets set by libc and is supplied to it by the kernel via the ELF loader. This is achieved by ELF auxiliary vectors, namely the AT_SYSINFO. ELF auxiliary vectors are used by the loader to pass certain information from the kernel to the process. They are placed on the stack right after the environment variables by the loader. They are defined in binfmt_elf.c. AT_SYSINFO auxiliary vector holds a pointer to the __kernel_vsyscall function. The straightforward idea for a SSP bypass with a stack overflow using a large buffer is to overwrite the stack past argc, argv array and environment var pointers up to auxiliary vectors and overwrite the AT_SYSINFO with an address of our arbitrary code. Then, when the process tries to invoke a system call, instead of calling __kernel_vsyscall it would jump to the address of our choosing. The program above has crashed because the environment has been overwritten by the overflow. We could try to make our overflow overwrite the environment pointers in such way that the environment parsing code doesn’t crash but in case of Bitcoin-qt there is another path. Bitcoin-qt is a GUI application that utilizes Pthreads. By following along the thread initialization code it can be observed that each thread will have it’s own copy of the AT_SYSINFO pointer. To achieve initial code execution in the Bitcoin-qt application, we overwrite this thread-local pointer which can be reached by making a large buffer overflow. Then we subvert the SSP’s error reporting mechanism which tries to invoke a syscall to redirect the execution to a location of our choosing. A couple of problems arise from this overwrite. Mainly, the __kernel_vsyscall function pointer is now invalid and any system call our ROP chain or shellcode tries to execute would again jump to the overwritten address and eventually fail. This would be bad for the exploit so we have to fix it. Note: the above gadget requires two readable addresses to be at esp+0x14 and esp+0x18. When the __kernel_vsyscall is restored, the exploit can continue as usual. 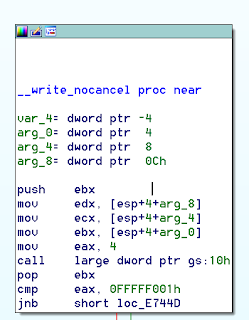 We use mprotect() to change the memory containing our shellcode to executable and then jump to it. The complete exploit can be found here. 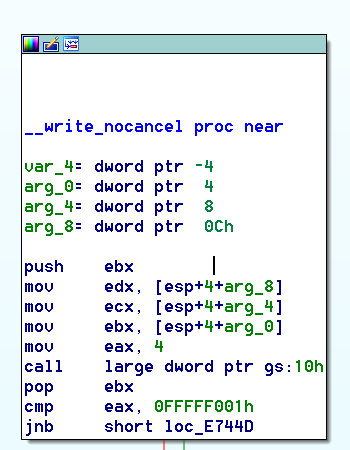 Note: this exploit doesn’t address the issue of ASLR and thus contains a number of hardcoded addresses. Here we demonstrated an interesting side effect of SSP when combined with Pthreads. It illustrates how a seemingly hard to exploit issue can still be exploited due to unforeseen consequences arising from the complexity present in modern process execution chain.